The City received an updated request from Designhaus Architecture to consider a rezoning of 2441 Pinecrest from R-1 (Single-Family Residential) to R-3 (Single/Multiple-Family Residential). The applicants are proposing to reuse the former church building with up to 30 multiple-family units and are preparing a formal conditional rezoning application. In the current phase of the project, the applicants are holding a community listening session on Tuesday, September 11th at 6:00 pm to hear the community's concerns about the project. The next step will be to hold a discussion with the Planning Commission on Wednesday, September 19th at 6:30 pm. Depending on the feedback at the Planning Commission meeting, the applicant would formally resubmit a conditional rezoning application. The Planning Commission previously held a public hearing on Wednesday, July 11 at 6:30 pm to consider the conditional rezoning application and site plan. The item was tabled in order for the applicant to provide more information. Meeting materials, including plans and a staff report are available at this link. What is a Conditional Rezoning? A conditional rezoning allows for an applicant to request a change in zoning with conditions that limit use of the property. Some examples of conditions could be to limit the number of units in a project or prevent certain uses allowed in a zoning district. More details can be found in Sec. 24-325 of the zoning ordinance. What does the current R-1 (Single-Family Residential) zoning allow on the site? R-1 primarily permits single-family detached dwellings, but also permits institutions for religious worship (the current use), libraries, public buildings, and other uses as special land uses. More details can be found in Article III. - Residential Districts of the zoning ordinance. How did the proposed plan for 30 units compare to a plan for single-family detached dwellings? 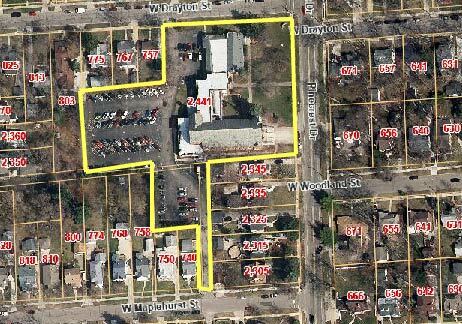 The site is 2.47 acres, which would equate to an estimated 12 units per acre. The proposed plan aligned with R-1 zoning requirements for a maximum of 12 units per acre, which is less than R-3 zoning requirements for a maximum of 35 units per acre. The conditional rezoning agreement would limit the overall units of the project. If an applicant were to propose a demolition of the existing structure to build new, single-family detached units, they could roughly build 12-14 units based on required setbacks, circulation, etc. without a rezoning. How can I review the documents and plans submit for the project? A revised site plan has not been officially submit or reviewed at this time. If a revised site plan is submit, physical copies of the documents will be available at City Hall during business hours, Monday-Thursday 8am-5:30pm. If the project requests City assisted tax incentives, what would the process include? If the development team requests tax incentives, such as Brownfield Redevelopment or Obsolete Property Rehabilitation Act incentives, the project would need approval from City Council. The project would first need site plan and conditional rezoning approval by City Council. The project would be required to meet the City's inclusive housing policy and provide 25% affordable housing units if the project includes 25 units or more. To learn more about the City's inclusive housing policy, click this link.